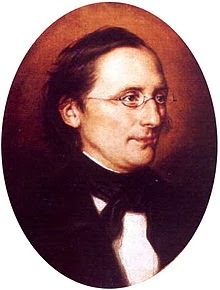 Karl Friedrich Wilhelm Ludwig was born on December 29, 1816 in Gottingen, Germany. His father had been on officer in the Napoleonic Wars. Ludwig graduated high school in 1834 and started his medical studies at the University of Marburg. He was relegated from the university because of his political activities and he continued his medical studies at the University of Erlangen and at the School of Surgery at Bamberg. He returned to Marburg in 1839 and finished his medical doctorate in 1840. After graduation he worked in the laboratory of Robert Bunsen and as a prosector in the school of anatomy at the University of Marburg. In 1846 he was appointed professor extrordinary in anatomy at Marburg and in 1849 he was appointed professor of anatomy at the University of Zurich. Six years later he went to Vienna and and an appointment teaching at the Josephinium, a school for military surgeons. In 1865 he took a position at the newly created department of physiology at the University of Leipzig. In 1869 he was called to develop and be the director of the newly created physiological institute at Leipzig that would eventually be named after him. He remained there until his death. Ludwig's research dealt with the circulation of fluids in the body. His first paper, published in 1842, described the circulation of blood in the kidney and was the first to describe the function of the glomerulus. He also investigated blood pressure and designed an instrument to measure and record it. His investigations also included secretory glands and lymph circulation. More important than any of his research results it was his methods that had a lasting impact on the study of physiology. Up until the time of Ludwig physiological research involved the belief in vital forces, forces generated by the body that sometimes went against physical law. Ludwig's insight was that the forces of physics and chemistry played a important role in physiological processes and his methods sought to show how these natural processes affected physiological systems. For his insights and use of methods he is often called the father of modern physiology. Honors won by Ludwig include the Copley Medal in 1884, given by the Royal Society of London and foreign membership in the Royal Swedish Academy of Science in 1869. Ludwig died on April 23, 1895.